It is difficult to fully express how important Batman is to the relationship between comic books and movies. While there had been other impactful superhero films like Richard Donner's Superman, most of the time, the comic book properties were treated with childish camp. And to be sure, there is a great deal of camp in Tim Burton's vision. But for the first time it felt like films were taking their cues directly from the comics. I had just started reading comic books in 1988. Burton's movie came out a year later. And it came out 3 years after the dark re-imagining of him in Frank Miller's The Dark Knight Returns. But I remember being blown away by the all black costume. It didn't look like the comic book version of the character, but it felt like it was. A lot has been said about the darkness of the film. And as you can read from the above, it is something which factors heavily into the feel of the movie. Burton jettisoned the bright pastels and daylight adventures of the 1960's TV show. Here was a Batman that felt like he melted out of the shadows to prey on the fears of criminals. This movie is mostly about tones. Burton is less interested in telling a grounded story as he is immersing you in a unique aesthetic. He wants you to feel transported. Batman also does an incredible job of world-building. The retro-40's look gives the movie such a distinct flavor that it feels nostalgic and new at the same time. By mixing the classic with the modern, Burton unsticks his movie from any particular decade or era. Stan Lee (of all people) pointed out something very important about the movie that I've never been able to overlook since. Batman is not a Batman movie; it is a Joker movie. Bruce Wayne is an enigma, an object of mystery, especially in the first act. On the other side, Jack, soon to be Joker, is given a series of obstacles, motivations, and dangerous relationships. This is not necessarily a flaw, but it is does lead to the problem down the line of villain overload in later superhero films. While great villains are important, they are there to show the hero's journey and not vice-versa. And the performances are excellent. Nicholson gets most of the notoriety because of his showy take on the Clown Prince of Crime. And the actor chews up as much scenery as possible without it feeling out of place for his character's insanity. But people should not overlook Michael Keaton's seminal performance. It should be remembered that his most famous works to date were Mr. Mom and Beetlejuice. Many have noted that if the internet had been prevalent in that day, there would have been a huge online backlash to his casting. But Keaton does some great things with the character. It was Keaton's idea to give him the lower-registered voice that has become standard in our portrayals of the Dark Knight. He gave him his cool and distant demeanor. Watch Keaton's performance when he is not playing "Bruce Wayne" and he is simply inhabiting Bruce's world. He is stoic and restrained. And he came up with the iconic line, "I'm Batman." The only time Keaton breaks from this is in the confrontation with the Joker in Vicki Vale's apartment where he falls back into Beetlejuice voice. Kim Bassinger, Michael Gough, Robert Wohl, Pat Hingle, and Jack Palance also do a good job. It is a shame that both Vicky Vale and Alexander Knox were jettisoned from the following films. And while it breaks with comic book canon, having the Joker be the one who kills Bruce's parents creates a strong personal, primal dynamic to the relationship. And Danny Elfman's score cannot be overlooked. His themes may not be as iconic as John Williams' take on Superman, but hearing them immediately conjures a very specific feel that was carried over into the animated series. The movie does have its share of flaws. The biggest is that Batman is a killer. Like Batman vs. Superman, this movie does not understand that fundamental aspect of his character and how that is his most important rule: the protection of life. The other is that despite its dark tones, the movie lends itself to a kind of camp that too easily slides into stupidity. 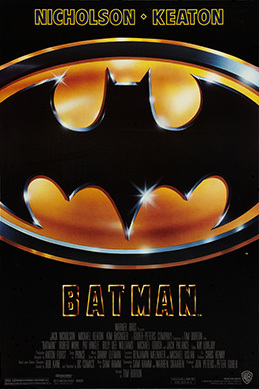 Luckily this film is able to hold the line, but you can see how quickly that slippery slope led to the devolution of the franchise in subsequent Batman films. But despite these future failings, the original Batman still holds up incredibly well today. And that is why it deserves its place in the greatest superhero movies of all time.